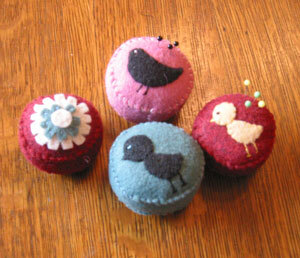 I have been having a lot of fun with felting lately, mostly needle felting. 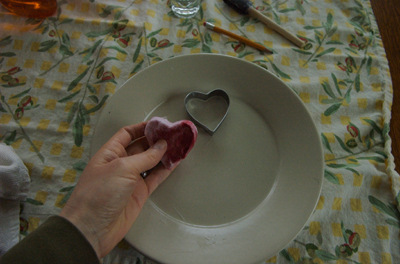 I decided to try some "wet felting" this week and made some cute little valentine hearts. 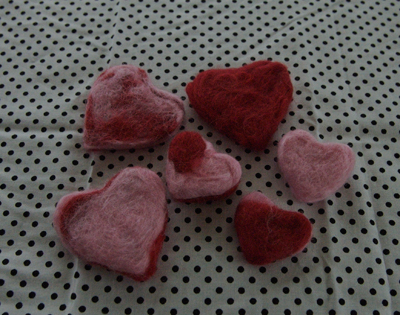 Wet felting is so easy and was a fun project with my 3-year old. Here is a quick little tutorial on how to. 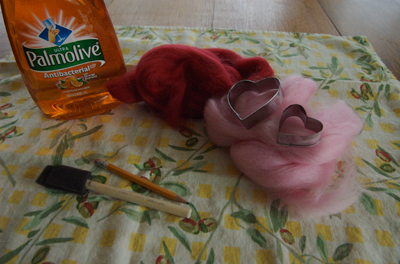 Supplies needed: Wool roving, cookie cutters, dishsoap, very warm water, a pokey tool like a pencil, chopstick or even just your finger. 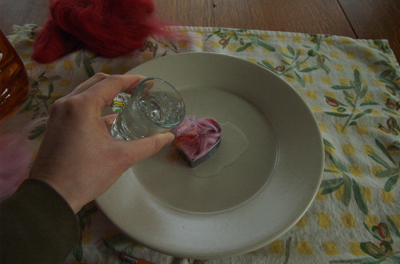 Pull off some of the wool roving and press it in to the cookie cutter. I used a little of each color and gently twisted them together to make a swirly effect. 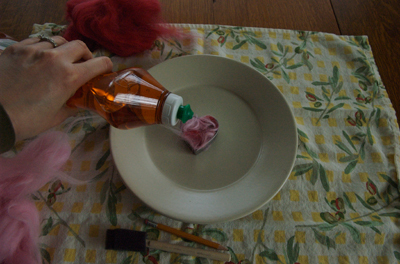 Add a drop or two of dish soap. Try not to add too much as I did the first few times and it became way too soapy. Add a little hot water. Poke, Poke, Poke...this takes a little while and the first time I did it, I used my finger and then my friend told me that she uses a pencil on the eraser side (thanks Brandi!). It works great. 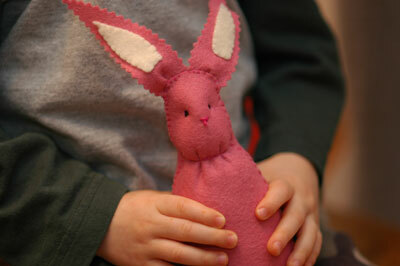 Just keep poking until the felt feels a little harder like its meshing together. I flipped it over a few times and poked the other side as well. I made mine in to a mobile. 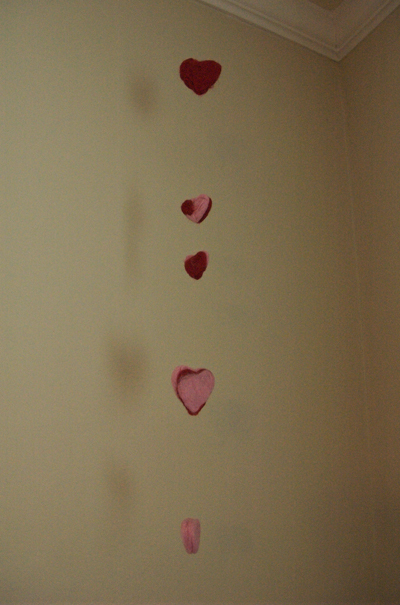 Just use a extra long needle and invisible thread to string them up, placing knots under each heart to space them apart. Do you know how hard it is to take photo of a mobile? It's not easy I tell you. But you get the idea. Wool Felt Santa finished for Labor Day! Finally! I have finished this wool felt Christmas wall hanging. I started this little project well over a year ago. 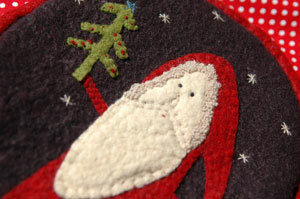 I love this folk art look for Christmas decorations and the wool felt is really easy to work with. I got to practice a LOT of french knots on this little project. Santa's hair is all french knots. I picked up this pattern at a quilt show a while back, the pattern is available here. 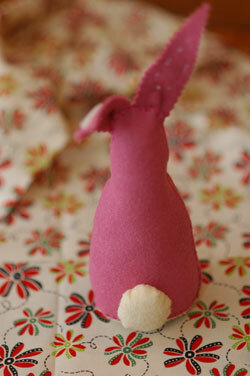 I just finished this little felt bunny tonight. I saw something similar in the book Last-Minute Fabric Gifts when I was in the bookstore the other day. I didn't want to buy the book just yet so I studied it for a while and then ran home and made some sketches. My first two attempts were pretty bad and in doing so I ran out of the nice white wool felt I had. 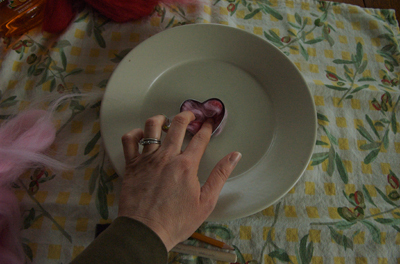 But I found this piece of pink felt and it all came together. I know it's only January but I've had my mind on spring lately. I like how this turned out and I think I might make a few more and maybe some other little goodies to display for Easter. Johnnie insisted that this bunny needed a hat but I talked him in to a tail instead which I had forgot to put on and added it last. 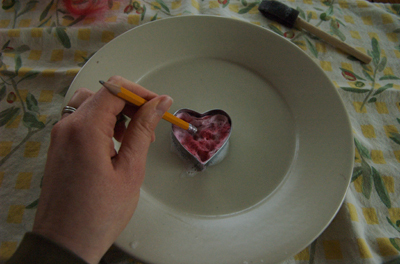 Now back to those unfinished oven mitts! 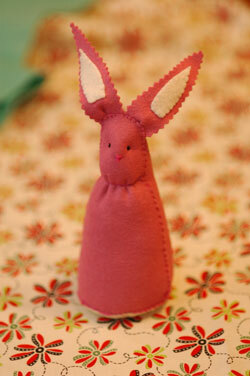 I recently rediscovered the joy of crafting with felt. I was inspired by all of beautiful pincushions made by Cassi over at Bella Dia and decided to try a few of my own for holiday gifts. I had all of this wool felt left over from an unfinished penny rug project and I love that I finally put it to good use.